The driving test lasts about 40 minutes. During this time you must demonstrate that you can drive safely and competently in a variety of road traffic situations. I will pick you up an hour before your test to have a warm up drive and we will go together to the test centre about 10 minutes before your test. At the beginning of the test the examiner will check your eyesight (reading a number plate from 20 meters) and then ask one of the 'tell me' questions about basic car maintenance. A further question will be asked, 'show me' while you are driving. 4)Pull up on the Right-hand side of the road and reverse for 2 car lengths then re-join the traffic. You may also be asked to do an emergency stop. You will also be tested on independent driving as part of the practical driving test. This section will last for about 20 minutes, either following a series of directions from the Sat Nav or following traffic signs. To help you understand where you're going, the examiner may show you a diagram. It doesn't matter if you don't remember every direction, or if you go the wrong way - that can happen to the most experienced drivers. 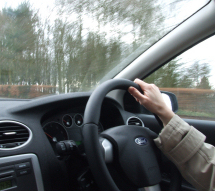 You must be well prepared for your driving test so that you can cope with any situation that occurs. The examiner is not looking for a 'perfect' drive but one which clearly shows you are a good safe driver. It is therefore important that we decide together that suitable progress is being made on your course.